The Single Currency gained against the US Dollar as the US Congress reached an agreement about funding the government, but Trump is still not ‘happy or thrilled’ with the border deal. Moreover, investors took a break from their US Dollar buying spree as other headlines showed that trade talks will continue this week, with Treasury Secretary Mnuchin saying that they are “looking forward to several important days of talks.” In economic news, the EU didn't release relevant data, while the US offered some minor figures, with the NFIB Business Optimism Index down to 101.2 in January from 104.4 in December, and the JOLTS Job Openings for December, which beat expectations by printing 7.335M. The Fed's head Powell offered a speech not related to monetary policy, yet in the middle, he said that he doesn't think the probability of a recession is elevated, nothing that the market didn't hear before. The EU will release December Industrial Production today, while the US will release Core CPI updates for January which can have a strong impact on this pair. The Euro bulls are back! 1.1270 proved to be a very strong support level. Price broke above 1.13 the previous resistance which should act as the new support now. 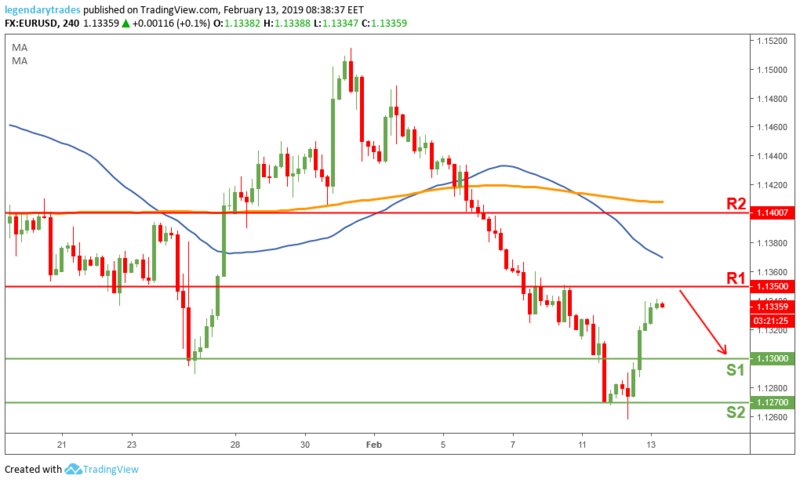 The bulls need to take out 1.1350 (R1) to continue their recent momentum towards 1.14 (R2) and the bears will try to retest and break below the 1.13 (S1) once again, to take price towards 1.1270 (S2). The Euro bears are still in control in the big picture as long as price is trading below 1.14.